Welcome to the first edition of LMS Review. There are a few advantages of advancing years, free TV, not that I spend much time in front of the box, whilst free bus passes will come in useful when I cease to drive. There are others, but to me the best is to be able to look back over the years and say I was there, I saw it, or I did it. The observation of railways before I began to make models of railway subjects and then the enjoyment from modelling has been a wonderful lifetime hobby. I also spent a few years in railway service, mostly on the footplate, and this experience was valuable and has often given me an advantage when discussing railway practice with other modellers. There are varied opinions about the best way to enjoy aspects of the railway hobby and it is clear that many railway enthusiasts began by observing the steam railway in action, but today this is not possible. The final end of steam power on railways in Great Britain came a few years after 1968, when it ceased on the nationalised system; the final examples were a few small engines working at collieries or industrial sites that were rail connected. Today we have a number of preserved railways, also known as heritage railways, and they do a splendid job, but they cannot fully replicate the trains that ran over the British railway system. Usually, but not always, the locomotives employed today are much larger than the types employed on the branch passenger trains before the end of steam and the coaching stock is usually bogie corridor stock, which probably would not have been used on many of these lines, but it is the absence of freight traffic that means it is virtually impossible to recreate the steam railways of yesteryear. Therefore I believe the best way to recreate the steam railway is in model form. I am reminded that some railway companies used model railways to teach their staff about signalling and how it was done. Today I believe that models can be used to demonstrate traditional operation but, to be accurate, care must be taken when they are designed. It is a fact that some modellers get ideas and inspiration from the work of other modellers, but if the models that inspire them are not correct this can lead to mistakes being perpetuated and, as a result, the mistakes become accepted as faithful railway practice. 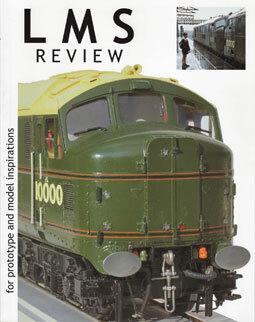 Therefore the publisher and I concluded that if we could produce a journal that contained information which would be of value to modellers, then we may be able to help to raise the standard seen at model railway exhibitions. However, this does not mean that we will ignore articles not directed towards modelling. The planned period to be covered by this journal is from the pre-1923 practice and equipment that was used by the LMS and in many cases survived well into the British Railways era until the end of steam.